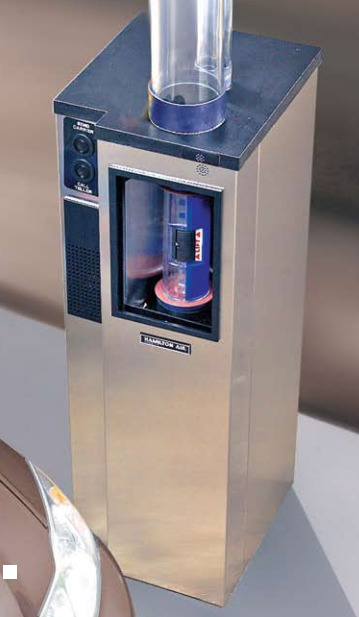 The Hamilton Air tube system, HA-1000 is the industry standard for 4 ½” pneumatic air tube systems. HA-1000 air tube systems are available in a wide variety of configurations. Contact us today for special pricing. 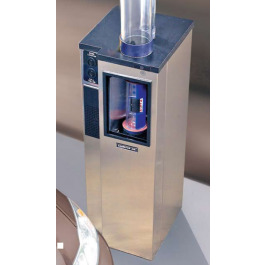 The Hamilton Air HA-1000’s superior quality, affordability and flexibility set the bank and credit union, weigh station, manufacturing and warehouse industry standard for 4 1/2” pneumatic drive-up systems. Whether new construction or remodeling, HA-1000 systems provide the ultimate in versatility and accommodation for tellers and customer-service representatives. Styling blends with any architectural environment. Operation is simple, straightforward and reliable. The HA-1000 is ideal for simple overhead drive-up applications right next to the building along with long distance runs underground through parking lots. Hamilton Air’s optional Hurricane Blower can be added for extremely long distance projects to help speed up the transaction. Super reliable engineering combined with all weather stainless steel exterior makes the HA-1000 drive up lane consoles low maintenance and easy to service. Hamilton Air HA-1000 systems are ideal for new construction and replacement / retofit projects. The HA-1000 can even replace old 4 inch systems and extra deep old downsend units as well. Installation is simple as there are no blower packs to be installed in the canopy or remote location. Our patented PowerStar Air Turbine is located in each customer terminal unit. The HA-1000 comes with Hamilton Air’s superb 5500 Series full duplex digital Audio System. We also offer optional one-way and two-way LCD video systems. The HA-1000 comes with our standard overhead teller terminals, but other options are available including double-sided and motorized units.